A bit late in the year to be declaring my intentions, I suppose, but it's always good to write down your goals, don't you think? Last year I excelled at vintage pledging. I did a lot of sewing in general--the most I've ever done in a year. I took sewing and blogging more seriously and made great strides in both (in my opinion). 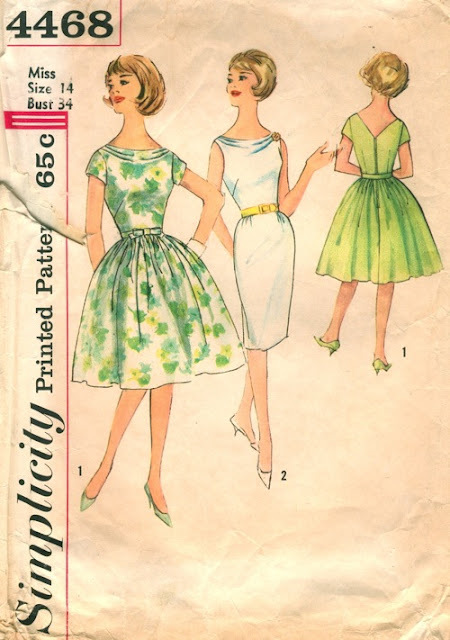 This year, I'll still be sewing in that vintage-inspired "modern mid-century" style I've defined for myself (clean lines, feminine touches, classic styling, luxe fabrics), but I don't think I'll have the same emphasis on sewing true vintage patterns. Of the things I've shown on the blog so far this year, I've used mostly Big 4 patterns (including some vintage repro patterns and a vintage-inspired Gertie pattern) and skipped a pattern altogether for my mariniere top. I also recently purchased about 15 Simplicity patterns for $1 each, so... I have some sewing to do! Overall, I think my pledge is something less like "sew 5 vintage patterns" and more like like "be intentional in my pattern and fabric selection, continue to develop my 60s-inspired everyday wardrobe." Ugh, sounds like Wardrobe Architect has struck another innocent sewing blogger! 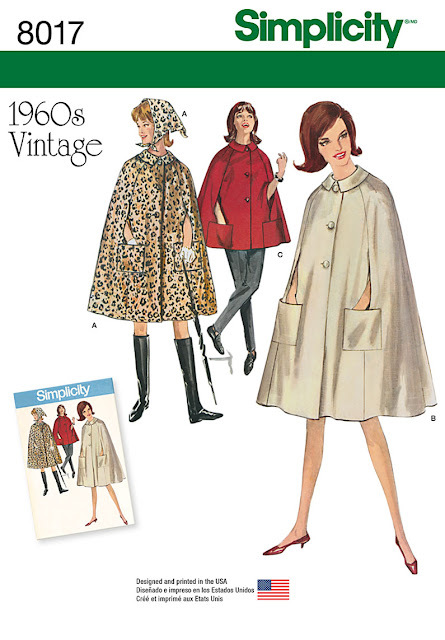 Simplicity's 60s rereleases have just been so great! i have this cape muslined, just waiting on that perfect fabric. Most of the patterns I purchased are for tops, and so, to go along with them, I also want to make more knee-length full skirts. I'm loving the slightly longer length of my neon skirt, and I find full skirts feel very "me," and they are easy for me to work in. While these are certainly vintage-inspired, they don't use a pattern at all, so they aren't necessarily part of my #vintagepledge, you know? What vintage (or vintage-inspired) sewing pledges do you have this year? Have any great patterns in your queue? ps: i have some completed items to show you, but my pictures weren't quite up to par. hoping for sunny days ahead; it was so dreary this weekend! Never too late to set or revisit goals! It is possible that as your skills grow and change you might find that you expand and or change your list. I know that I made lots of T shirts when I figured out how to use my serger! T shirts weren't on any of my lists until they were. I think that Simplicity 4468 would really look good on you. That front neckline is so pretty. Do you have ideas for fabric? I'm (gasp) actually shying away from a lot of the vintage I use to love! I've succumbed to wardrobe planning as well. In the process, I've found that I love vintage silhouettes , but usually wear more modern styles in polka dots, stripes, florals and KNITS. So, I'm thinking this year will be more separates for work, and maybe some actual vintage for special occasions.